Difficult thing to shoot flowers in the middle of winter. Always a problem when you live down the bottom of the world, when the top half is in Summer. Anyway, thank god for the Winter Gardens at Auckland Domain and thanks even more for the splendid Orchid collection they've got out at the moment. the saturation's so great on this they almost look like alien flowers. just a beautiful shot. 10. I love the lighting here, especially playing on the petals. There is a lot going on in this photo. You might consider simplifying to experiment and see what happens. Kinda surreal looking color ... cartoonish in some way .. i can't put a finger on it but it's cool. The sharp detail and the blue make this looks as if it were from another world. Nice one! 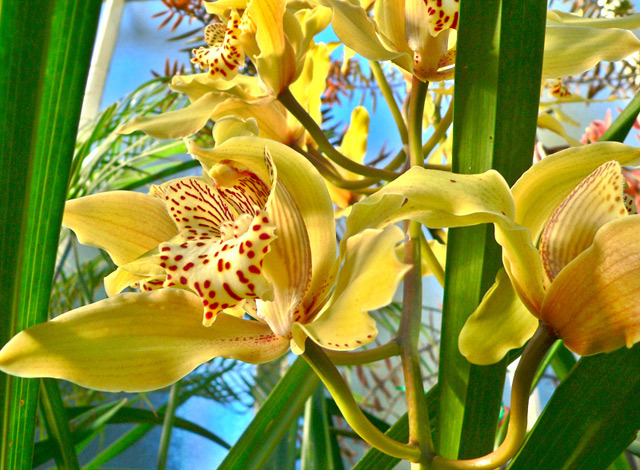 Orchids are wonderful flowers and those yellow ones seem very beautiful but the photo is a bit busy . the overall composition is very graphic, airy and energized, like a pattern on curtains or something--i like it. Proudly hosted by Sargasso Networks. Current Server Time: 04/25/2019 07:46:13 AM EDT.